My answer to this is, "Nick, let's negotiate an extension and allow us to get some weapons for you and Carson by reducing your current cap hit. We love you, and we'll accommodate you." I think Nick also knows that if the Eagles get a "blow me away" offer, they'll have to take it. Well, that's certainly another possibility. Tack on another year, though I'm not sure I would want to 100% promise not to trade him at the deadline. The problem is I don't think lowering Foles' cap hit really gets the Eagles that far in retaining or adding players. And they also need picks, because the inability to add rookie contracts this year will also create potential problems (both talent-wise and cap-wise) down the line. I'm equally curious to see how they handle Peters and Graham. A lot of sentiment right now but like I said, they're usually ruthless. I don't think Bradham will be back. He's played well enough the last couple of years that I think he will get a contract somewhere. And I also think the front office may not be totally sold on him from a character standpoint -- going back to the multiple "gun in the APO" incidents a year ago. Always seemed to me to be somebody that belonged in Oakland\Las Vegas. If Foles is moved I also would expect the Eagles to look to find a "McGloin" type deal for a year to put somebody between a recovering Wentz and Sudfeld. Chase Daniel would make a lot of sense -- he would at a minimum get to showcase himself during a pre-season and perhaps some seasonal time with a good offense. I also read rumors Eagles may look to move a CB (I'm looking at you, Rasul Douglas) for a 3rd round pick. I read the same rumors, although Darby was speculated rather than Douglas. It makes sense to trade for draft picks from a deep position (which CB now is for the Eagles). Assuming Jones is healthy, they have four serviceable or better outside corners, with none of them showing they can play in the slot. Here’s the Eagles’ new third-down pass rush: Michael Bennett and Fletcher Cox on the inside, Derek Barnett and Brandon Graham on the outside. With Michael Bennett headed to Philadelphia, the Eagles now can explore a potential trade of DE Vinny Curry. If I remember correctly, the 5th round pick they sent to Seattle was the pick they got for Matt Tobin and the 7th they are getting back might be the one they sent to Seattle in that trade. That would mean they got Bennett for Johnson and Tobin. So Howie ends up getting a three time pro-bowler for two deep depth players. Boy is he on a roll. Makes me wonder if they would consider signing Kaepernick as a backup QB if they trade Foles. Which would also be kinda brilliant. Trade a QB who's been to the Super Bowl at peak value and replace him with another one (even if he didn't win) for nothing. It will be interesting to see what they want to do about the position if they do trade him. Sudfield may yet be the guy who starts the opener, but obviously they'll need another anyway. Sudfield may yet be the guy who starts the opener, but obviously they'll need another anyway. And they'll probably want a veteran guy to be able to step in. I wonder if a Josh McCown or Ryan Fitzpatrick make some sense. Now, we'll see just how much of a Houdini Howie can be. Knowing the Eagles will likely have to just cut Curry, will he be able to trade him for anything of value? God bless Howie. With Donnie Jones' retirement savings of about $1.8M the Eagles still need to drop roughly $8M by April 1 to meet the salary cap requirement going into 2018. They wave Torry Smith and Celek and they save $9M, many expected that would be the approach taken. So it intrigued me that there was so much recent talk about Vinnie Curry. But look at Bennett's 2018 salary compared to the two prior and two subsequent years. Something is really goofy here. It's all roster bonus -- and $5M of the $6M bonus is non-game, so it counts against whatever year the team assigns the roster date test to. How much you want to bet a bunch of the bonus gets dated during the 2017 league year. Now look at Curry's contract. Eagles cut him pre-June 1 and they save only $4M; and $5M if the trade him pre-June 1. But if they trade him post June 1 Eagles save $9M against the overstretched 2018 cap year. I think Vinnie made it clear to the Eagles he wasn't interested in restructuring his deal this month, so they needed to figure out how to trade him now, with a post June 1 delivery date. Here's a guess. Eagles already have a deal struck for Curry that will be announced after June 1 -- and if I believed in conspiracies I might even guess Vinnie will be playing in Seattle next year. I hope on of our Eagles journalists can put down the champagne glass long enough tis month to get a serious talk with somebody who can fill in the details of how they manage the cap number because to me that is what I'd pay to read about. How does this affect the Eagles' cap situation? One of the reasons this was an attractive move is because it makes sense financially for 2018. 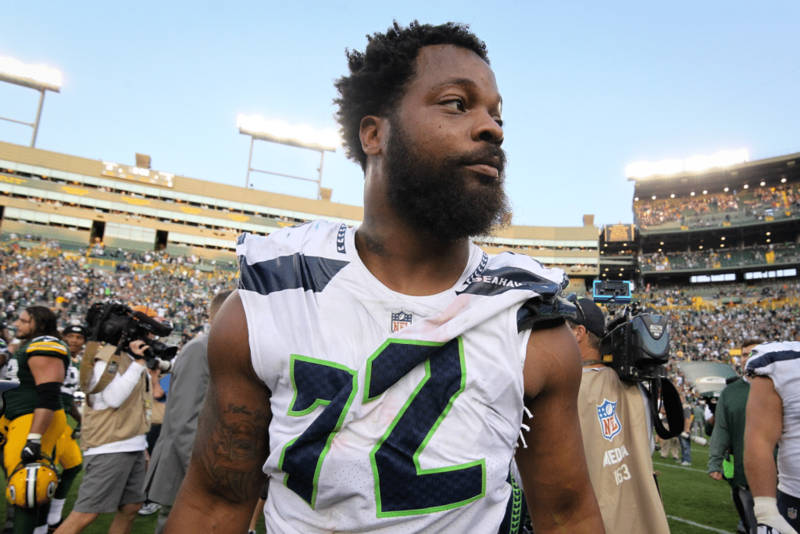 Bennett has a base salary of just $1.65 million for next season. Per a source, he's due a $3 million roster bonus on the fifth day of the league year and also has a per-game roster bonus that can total another $1 million (he gets $62,500 for every game that he's on the 46-man active gameday roster). Bennett's current cap charge for 2018 will be about $5.65 million. The Seahawks eat $5.1 million in dead money. The Eagles have other options too. They could convert that $3 million roster bonus into a signing bonus and spread that money out throughout the duration of his contract, which runs through 2020. By doing that, they would reduce his cap charge for 2018 to just $3.65 million. Bennett's salary jumps up to $7 million in 2019 and $8.5 million in 2020. Essentially, this is a one-year commitment for the Eagles. They can decide after 2018 whether they want to keep Bennett or part ways with him. Howie gets something for Torrey Smith, who was obviously going to be cut as a cap casualty. He trade Smith to Carolina for CB Daryl Worley. Worley is 23, born in Philadelphia, played at West Virginia and was drafted in the 3rd round of the 2016 draft. Creates cap space. Also allows to trade a CB as well, as we now have a lot of CBs. Philly.com had a story today about the Eagles' need for a new TE (with Gesicki dreams for the Penn State/Eagles fans). I gotta wonder about Martellus Bennett too, would he come for nothing? Does he fit? This seems like a fairly amazing trade to me. I have to figure Darby might be on the move now for sure. Worley looks he was a starter and still has 2 years on his rookie deal. And he's a former 3rd round pick and a local kid? Crazy. Eagles reporter twitter says the cap space room doesn't come until later, will still have to clear more cap space before it kicks in.